Buckle up, Young Adult readers: Ally Condie is back. After making a massive splash with her Matched trilogy, she published some fantastic Middle Grade books (check out Summerlost and The Dark Deep). This year we’re being treated to her new YA novel, The Last Voyage of Poe Blythe, and it sounds amazing. Poe has vowed to annihilate the river raiders who robbed her of everything two years ago. But as she navigates the treacherous waters of the Serpentine and realizes there might be a traitor among her crew, she must also reckon with who she has become, who she wants to be and the ways love can change and shape you. Even—and especially—when you think all is lost. As a special treat for Paste readers, we’re thrilled to exclusively reveal the book trailer and share an excerpt from Chapter 1. Watch, read and get excited. 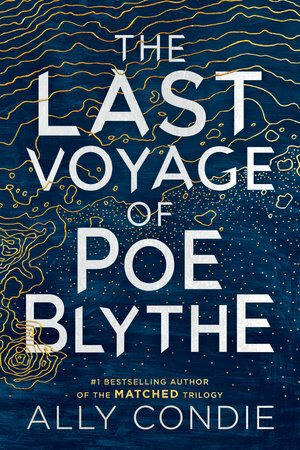 Dutton Books for Young Readers will release The Last Voyage of Poe Blythe on March 26th. There are two problems with the Admiral’s revelation theory. First, I don’t believe in God, so he can’t talk to me. Second, I don’t think I actually sleep deep enough to dream anymore. The Admiral and I watch the workers crawling over the dredge in the yard below. The ship came off the river yesterday, and it’s been hauled inland to the scrap yard for repairs. It’s the hot-orange, simmering-sunset time of day, bearable only because of the knowledge that there are just a few hours left until the cool of night. The crew must be sweating as they repair the armor on the dredge. I know from working on the scrap yard with Call how it feels to have your clothes wet and dry and wet again over the hours of the day; your hands smudged black with dirt and oil; skin tight across your nose from the sun; eyes scalded and dry from looking closely at shining metal, fitted gears. There’s a flurry of movement in the yard as the workers change positions. The dredge bristles with variations on front- and side-facing gears. Armor. When the ship is moving, its exterior crawls like an animal covered in parasites. The gears are strong enough to snap a bone like a twig, a hunk of iron like a tree branch. My position at these meetings is always strange. I’m not part of the Quorum. I only attend meetings concerning the dredge. And the citizens of the Outpost consider me a peculiarity. Not a person. When we pass in the street, they smile and keep their distance. Which makes sense. I’m aligned with the people in power, and it’s best not to disturb them. That’s common knowledge in the Outpost. Everyone’s got their work to keep them busy, everyone’s got to scrape to keep alive. We mind our own business. That’s what’s kept the Outpost viable all these years, on our own, without another major city or settlement within hundreds of miles. “Please,” says the Admiral. “Sit.” The wooden table and chairs in the room are scarred with use. Stray stubs of pencil and bits of paper have been left behind from other meetings. This is how the Admiral likes it. I don’t know where the Quorum usually meets, but whenever we gather here to discuss the dredge, the Admiral wants the room left as it is from when the people who actually work on the yard use it. He likes the workaday, part-of-it-all feeling it gives him. Bishop Weaver takes his seat on the right hand of the Admiral. When I’m in meetings with the Admiral, he likes me to sit on his left. General Foster actually presses his palms together in pleasure. “Wonderful,” he says. That’s not what we agreed, I want to say to him. I designed the armor for the ship in exchange for my life and for the lives of the others on the dredge on my first voyage. My only voyage. You would think that after Call died, I wouldn’t care anymore about dying. But I do. I saw him. I saw his eyes looking up and seeing nothing. I saw how gone he was. I knew he was nowhere else in the world or beyond. He was over. I have to give the Admiral credit. He doesn’t even blink. All I see is a slight tightening of his lips that shows I’ve surprised him.